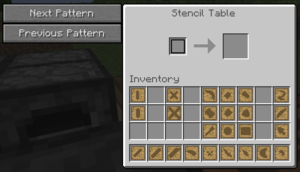 The Stencil Table is a machine from Tinkers' Construct. It allows the player to create one of 24 patterns, which can be used in a Part Builder to create components for Tinkers' Construct Tools and Weapons. The player can cycle through 24 options after inserting a Blank Pattern in the left slot. Stencil Table has no known uses in crafting. This page was last modified on 31 August 2018, at 13:31.